This air-conditioned hotel has prided itself on maintaining the highest of traditional values for over a century now, providing all this in luxurious and homely surroundings. The hotel has 42 rooms and a lobby providing a 24-hour reception and check-out service, lift access, currency exchange facilities and safe. Business guests may want to take advantage of the hotel's excellent conference facilities. The hotel bar welcomes guests to a quiet and comfortable setting for a drink, away from the usual hubbub of a big city bar. 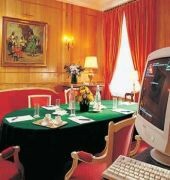 For a fee guests can also make use of the hotel's Internet access point, as well as both room and laundry services. The HOTEL CLARIDGE is a Tourist hotel. Located in City Centre area. Shopping is right next door and the nightlife/restaurants are right next to the hotel. 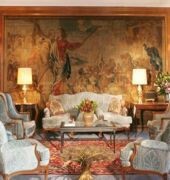 Descriptionclass="small" style="text-align: justify; font-size:11px;">This air-conditioned hotel has prided itself on maintaining the highest of traditional values for over a century now, providing all this in luxurious and homely surroundings. The hotel has 42 rooms and a lobby providing a 24-hour reception and check-out service, lift access, currency exchange facilities and safe. Business guests may want to take advantage of the hotel's excellent conference facilities. 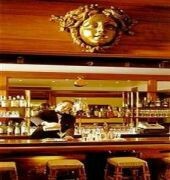 The hotel bar welcomes guests to a quiet and comfortable setting for a drink, away from the usual hubbub of a big city bar. For a fee guests can also make use of the hotel's Internet access point, as well as both room and laundry services. 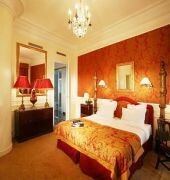 We booked 3 nights in April as our base to take part in the Paris Marathon. Hotel is very well located just off the Champs. Friendly and efficient staff. We didnâ€™t eat at the hotel so cannot comment on the breakfast. Our room (26) was nice, maybe a little on the small side but perfectly usable. Good wifi. The only slight disappointment was the bathroom, whilst immaculately clean it is very small, hence the reason for 4 stars not 5. We would definitely stay again if in Paris. We spent a week at this hotel and loved it! Fantastic location near major sites and easy access to the metro. The room was large, comfortable, and clean with nightly turn down service, complete with chocolates. The staff was attentive and very friendly; Laurent and the other team members were very helpful with reservations, allowing us to make the most of our trip. If you are looking for a romantic place, a great location, and a welcoming, accommodating staff...this is THE place. Already looking forward to our next stay! 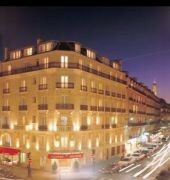 I went to Paris and stayed at the Hotel Claridge for one week. It was lovely and quaint. The decor was old world and beautifully decorated. All of the managers, staff, dining persons and hospitality were kind and helpful. Everyone was so pleasant. Whatever our request, it was answered without hesitation. They were even concerned about out safety while we were out. The location was just perfect.I enjoyed every minute of it and would return again. Thanks for making my trip fantastic.Lynda H.
What a gem--an oasis of calm and helpfulness. My third stay--so glad to see that's it is still as wonderful as ever. Lovely staff, quiet and elegant rooms. The location is convenient to all. Can't wait to return!